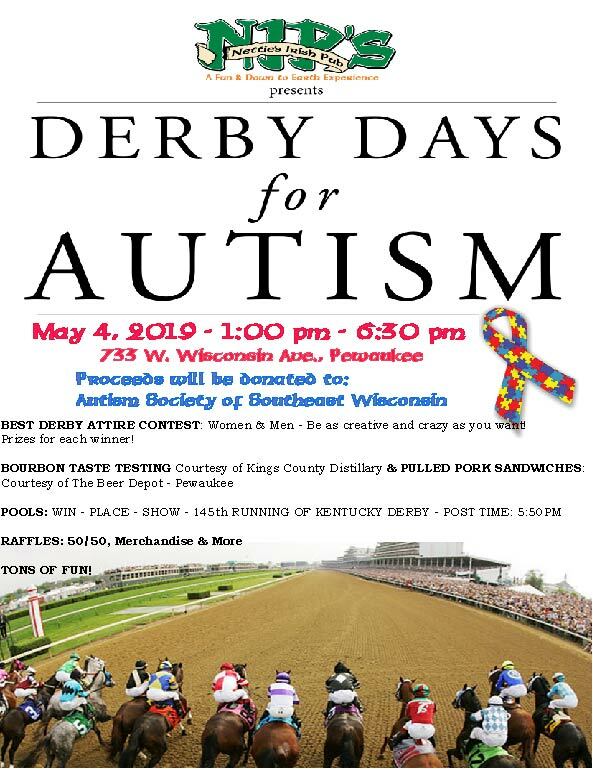 Derby Days for Autism is right around the corner! The 145th Running of The Kentucky Derby and NIP’S 7th year running Derby Days for Autism to help improve the lives of all of those affected by Autism! In 2018 the CDC determined that approximately 1 in 59 children is diagnosed with an autism spectrum disorder (ASD). Just like us, you likely have someone special in your lives that is affected by Autism. Whether it be a family member, relative, co-worker, neighbor, friend and/or an acquaintance, they can all use our help! Please give some strong consideration to attend this great & fun event. It can help The Autism Society of Southeastern Wisconsin, http://www.assew.org, help so many and you can feel a part of it! Even if it’s stopping by to throw one dollar in the hat! It all helps and every one of us is so appreciative of you and your generosity! Bourbon Taste Testing – Pulled Pork Sandwiches – Mint Juleps – Raffles – 50/50, Merchandise – Derby Attire Contest for Women & Men (Hat’s, Shirts, Pants,) use your creativity – Pools & More! We thank you all in advance for the consideration for this great cause, wish you a great day and hope to see you on May 4th!